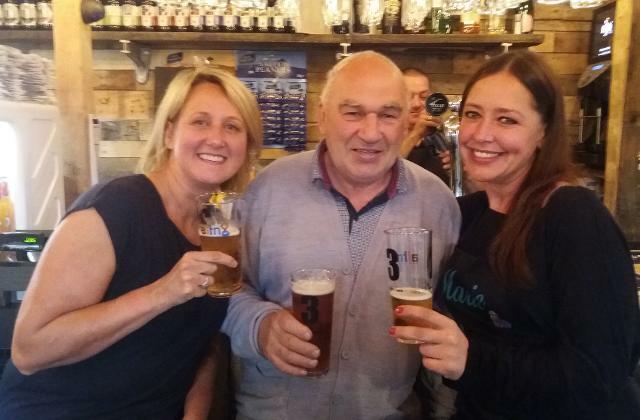 Visitors to Bury's award-winning Market can now raise a glass to another piece of history with the opening of its very first licensed premises. DollizBar has opened its doors for the first time in the indoor Market Hall, and promises to draw even more customers to the town's most famous attraction. The bar is the brainchild of Lizelle Bramall, who already has two other successful businesses on the market - the neighbouring Dolls House Hair and Nail Salon and Dolls Face Make Up Stall. Lizelle said: "As a successful established trader in Bury, I spotted a gap in the market - excuse the pun! - and decided to open a small licensed premises. My aim is to offer good quality local produce and beers on Bury Market, and so I am sourcing my cheese from the market's Cheese Plus, beers from Bury's very own Outstanding Brewing Company, and local fruit and veg from our fruit and veg stalls. This venture is unique on Bury Market and I hope that it will add something to the offer and variety available, and be a welcome meeting point for thirsty shoppers." DollizBar, located on stall 45 in Bury's Market Hall, is open from 9am to 5pm, and will serve alcohol between 11am and 4pm along with cheese platters, sandwiches, olives and specialist teas and coffees, and will serve a guest Cask Ale from Wednesday to Saturday each week. Pictured: sampling the beverages are Susan Nicholson, Michael Finnerty and Marie Torkington.